Hindu orthodox tradition holds the Yoga Sūtras of Patañjali to be one of the foundational texts of classical Yoga philosophy. However, the appropriation - and misappropriation - of the Yoga Sutras and its influence on later systematizations of yoga has been questioned by scholars such as David Gordon White, but reaffirmed by others such as James Mallinson. 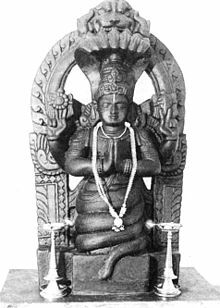 Modern scholars of yoga such as Philipp A. Maas and Mallinson consider the Bhasya commentary on the Sutras to be Patanjali's own, and the Sutras to be his summary of older accounts of yoga. 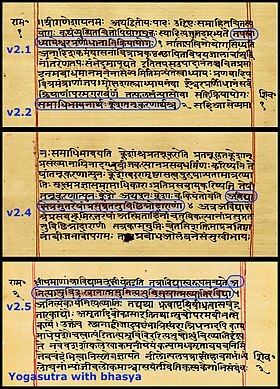 The combined document is thus considered to be a single work, the Pātañjalayogaśāstra. ^ a b Whicher 1998, p. 49. ^ Mallinson & Singleton 2017, p. xxxvi note 34. ^ a b c d e f g Maas 2006. ^ a b Mallinson & Singleton 2017, pp. xi, xvi–xvii. ^ Whicher 1998, p. 86. White, David Gordon (2014). The Yoga Sutra of Patanjali: A Biography. Princeton, NJ: Princeton University Press. ISBN 978-0-691-14377-4.